L/Sgt. Woolf Blint served in No.6 Commando from, at least, 29th May 1941 and was later promoted to a full Sergeant. For a month between the end of 1941 and the early part of 1942, Sgt. Woolf Blint worked as part of a small band of Commandos who had been tasked with measuring the shore gradient of the Normandy coastline. Working in small three-man groups the Commando survey parties would travel from Portsmouth and Poole in high-speed launches and, as they approached the Normandy coastline they were dropped over the side of the craft into the freezing water to carry out there survey work  using illuminated watches and waterproof pads & pencils, and using measuring sticks and survey wheels, the Commandos would wade around in the freezing surf at high tide marks. Later, this valuable information was to be used in the planning of the Operation: Overlord invasion of N ormandy . In 1942, Sgt. Woolf Blint was also present with No.6 Commando during the aborted Operation: Myrmidon assault on the River Ardur estuary and the town of B ayonne beyond it. In November 1942, along with the rest of No.6 Commando, Sgt. Woolf Blint (now serving in the Commando Intelligence Section) made the Algiers landings that signalled the Allied invasion of Vichy French held North Africa as part of Operation: Torch and, amidst the debacle and confusion of the landings it is he who is credited with using the full scope of his map reading skills to direct the surviving Commandos away from the beaches to their arranged rendezvous points. Sgt. Blint served under the Commando Intelligence Officer Lt. Paul Peter Lorraine MM, as he could speak some German, until his wounding and capture during the Battle of Steamroller Farm on 26th February 1943, when the Commando had surprised the advancing spearhead of the German Operation: Oxhead counter-offensive and, despite being severly outnumbered, they had shown great tenacity and determination until being forced to withdraw through lack of ammunition. The wounded Commando Sergeant was treated respectfully by medical orderlies of the German Paratrooper Battalion that had engaged the Commandos, and was even presented with an opportunity to meet the German machine gunner who had caused his injuries, before he was moved to an Italian Field Ambulance where he was thankful to receive ‘a good dollop of spaghetti’ and some further medical treatment. After several days of rest in the Italian Field Ambulance the healing of his wounds was considered to be progressing well enough for him to be flown to the Italian mainland and a Prisoner of War Camp outside of N aples . He had been warned by a German NCO before stepping onto the dilapidated Junkers transport plane that mistakenly R.A.F. Spitfires operating out of Malta were in the habit of shooting down the prisoner transport planes, so with a fair amount of trepidation he boarded the plane and was extremely thankful when, after an uneventful  but extremely uncomfortable flight  he felt the wheels of the Junkers plane touch down on the runway at N aples . Along with the rest of the PoWs on the flight to Italy he was transferred to a holding prison (a converted hotel in N aples ) for several days, during which time Italian medical orderlies examined, cleaned and redressed his wounds. Eventually, under heavy armed guard, the prisoners were taken to a railway yard in N a ples where they were loaded into cramped and stuffy wooden railway box-cars and sent off - despite many delays caused by Allied bombing of the Italian railway infrastructure - to their eventual destination the notorious German PoW Camp just outside F ran kfurt , known as ‘Dulag Luft’. The camp itself was well known to Intelligence Sergeant Woolf Blint from Intelligence Briefings whilst back home in the United Kingdom, as it had been especially established by the German authorities to serve as a ‘specialised’ interrogation camp for about two hundred R.A.F. personnel and those from specialist Allied service units, such as the Commandos, who were all considered to be extremely valuable assets. From the Intelligence Briefings given before the Commando left for N orth Africa it was known that, if captured and sent to Dulag Luft, their treatment there was highly likely to be traumatic. There they would likely be subjected to continuous interrogation by highly skilled Nazi interrogators as well as being mizzled by Allied PoWs who had been turned previously by their Nazi jailors. Despite this, British Intelligence had managed to infiltrate the camp and had already identified the exact names, ranks and duties of all of the prisoners there and their jailors. Revenge was waiting in the wings for all those PoWs that British Intelligence suspected of colluding with the Nazis. As a Jew and a Commando, Dulag Luft, could prove to be a lethal destination for Sgt. Woolf Blint if either his religious identity was discovered, or the camp jailors decided to act upon Hitler’s infamous order to execute an captured Commandos. Woolf Blint decided to make the extraction of information from him through interrogation as difficult as possible. In that way, he may just survive all that Dulag Luft had to offer him. Initially, Sgt. Blint was placed in solitary confinement without food, water or treatment for his  still healing  wounds. He was, however, provided with a mattress on the floor and an old and rusty tin can for a latrine. After four days of this isolation and deprivation the interrogations began. But to his surprise the interrogations consisted of ‘soft chats’ for hours at a time with a high ranking German interrogator in the garden of the camp, followed by unannounced ‘talks’ in his cell. At the most he was allowed one or two hours sleep between interrogations in an effort to deprive him of sleep. This process continued for five days, but on the last day he was subjected to a brutal and humiliating strip search and internal examination that left him in agony, before being threatened with sexual abuse by a horribly disfigured Luftwaffe Corporal, nicknamed “Frankenstein”. Before the Corporal could return to carry out his threats, Woolf Blint was provided with a discarded US GI uniform to cover his nakedness and moved to another area within the camp where he was given a meagre meal and informed that he was to be itransferred to another PoW camp, known as Stalag V111B. Stalag V111B was a secret PoW camp located in S ilesia , close to the German-Polish border and about twenty-miles east of Grottkau, its location known only to the top ranks of the German High Command. PoWs were delivered to the hidden camp using the Lamsdorf railway line. After another week Sgt. Woolf Blint and about one hundred and eighty other PoWs were herded into packed and airless passenger railway carriages for the week-long freezing cold journey from F rankfurt to Stalag V111B in S ilesia . Snow was falling around them as they disembarked the PoW train into their new jail, and Sgt. Blint decided that he would at first settle into life at the camp before making contact with, and declaring his intention to escape, to the camp’s escape committee. This done, he took employment in a Prisoner Work Party at the nearby Karl Mende Saw- Mill , situated in the tiny village of Grottkau to the east of the camp. It was expected that the PoW would remain in the Work Party Camp and would not return to main PoW Camp unless in need of medical attention. Yet conditions at the Saw Mill Work Party Camp were somewhat worse than in the camp. The PoWs, twenty-strong, were housed in an old and dilapidated wooden house at the rear of the Mill yard without heating, mattresses or pillows, and with only a single light blanket and one meagre meal a day for protection from the freezing conditions. In addition to the PoWs who formed a work party detail, the saw mill owned by Karl Mende also used cheap foreign labour  ‘Auslanders’ - from countries that had been overridden by the Nazi war machine. Woolf Blint recalled being constantly hungry, and the hunger pains often threatened to overcome him, but at times the provisions of the Red Cross Parcels (chocolate, condensed milk, soap, tins of soup, tins of meat and packets of cigarettes) would supplement their meagre food and would also serve as useful currency to obtain items that would be needed for a planned escape or the personal services of a local girl as arranged by a woman living close to the Saw Mill whose husband had been sent to the Russian Front by the Germans. Eventually, along with another PoW  an Australian called “Digger” Watts  he escaped from the Saw Mill and headed for the Baltic Sea port of Swinemunde, but they became caught up in the aftermath of an Allied air raid on the town and were arrested as potential saboteurs. Eventually, fearing that they would be shot as spies they declared their identities as escaped PoWs. “Digger” Watts was returned to Stalag VIIIB, but Sgt. Woolf Blint  portrayed as the dangerous ring-leader of the escape  was transferred to Mühlhausen, a satellite camp of Stalag VIIIB180-miles South-West of Frankfurt. Here he found conditions quite different from Stalag VIIIB, with escape attempts being frowned upon by most of the 1,500 PoW inmates. At Mühlhausen Sgt. Woolf Blint befriended a fellow Scot, Andy Mach, who had been captured in 1940 at Dunkirk, and the two began to hatch plans to escape to freedom towards the approaching Russian forces and the eastern front. After weeks of planning, during which they each managed to wangle a return to the main Stalag VIIIB PoW camp on medical grounds, they escaped from the main camp through the camp wire fence and immediately headed towards the old Polish town of Bauerwitz, where they were befriended by a Czech farmer who had been forcibly relocated to Poland by the Nazis, and who was pro-Allied, and who gave them some food and shelter. On leaving Bauerwitz they continued travelling east towards the Russian front, befriending some other farm-hands upon the way before entering the small town of Brzeg. Here, they witnessed a German soldier murder two small children who were happily and playfully riding on a pushbike and ignoring his instructions for one of them to dismount the bicycle. Wolf Blint, incensed by this openly callous act of brutality, stalked the German to a nearby small bakery and killed him by breaking his neck. Thereafter, helped by the Baker to hide the body, they left Brzeg and continued on to the nearby city of Breslau, which had been recently badly damaged by Allied air-raids. In Breslau they were befriended by a bar-tender in a café, who  in exchange for a captured German Luger pistol  arranged some shelter for them, some new papers, enabling them to travel freely on the rail network some much needed money. Purchasing tickets from the railway station they made their way to the Polish town of Brest via Lodz and Luckow, avoiding being rounded up to work on Auslander work details or being moved out en masse with civilian evacuees as the sounds of battle neared, and eventually on 1st December 1943 they surrendered to an advanced party of Russian soldiers from the armoured 1st Ukrainian Front under Commander Vatutin, and  after some security checks  they were enlisted in its ranks as fighting soldiers and issued with weapons and uniform. In temperatures of minus 15°C, from December 1943 to June 1944 Woolf Blint battled on the side of the Russian forces through the towns of Rowno, Berditschew, L’Vov and Lublin as part of Operation: Bagration. During this time he noted the brutality of the Russian forces and the policy to take no prisoners, German or otherwise. At Lublin, Woolf Blint volunteered to become a medical orderly treating some of the thousands of Russian casualties that were being cleared from the battlefields through the town. His close friend and fellow escapee from Stalag VIIIB decided to remain with the fighting unit of the 1st Ukrainian Front when it came time for the unit to pull out of Lublin. Eventually, the medical unit that Woolf Blint had joined moved on to Kielce and Krakow, and in February 1945 Woolf Blint became eager to move to the Allied Front and be reunited with British forces. He therefore requested a transfer to an armoured column heading for nearby Ostrava (Czechoslovakia) just a few miles from the Auschwitz concentration camp, and then in March 1945 he arrived in Brno where he commandeered an abandon German military vehicle, which  being a Willis Jeep  had obviously been previously commandeered by the German forces. In Brno he was befriended by a local Police Lieutenant, Alfred Weiss. Woolf Blint’s unit continued its move westward from Brno through Jilhava towards Prague. Here, Woolf Blint requested his release from the unit and his clearance to proceed alone towards the British and American lines, which was granted. He therefore set off in his commandeered jeep via Prague to Pilsen where he was introduced to a 55-year old Roman Catholic Priest, Father Pyotor Nicholous, who he agreed to transport with him on his drive across Europe towards the Allied lines. The Priest informed him that he was trying to venture across Europe to sell gems and jewellery that had been bequeathed to him for safe-keeping and sale to raise funds for some Czechoslovakian refugees. However, on entering the German town of Nürnberg, the Priest was arrested by US troops at the request of the Russians who had accused him of being a Nazi collaborator. After some time spent in trying to assist the Priest clear his name, Woolf Blint arranged the escape of the Priest from US military jail and spirited him out of Germany and into France. When they finally reached Paris, after V.E. Day, the Priest melted away into the crowded streets never to be seen again. 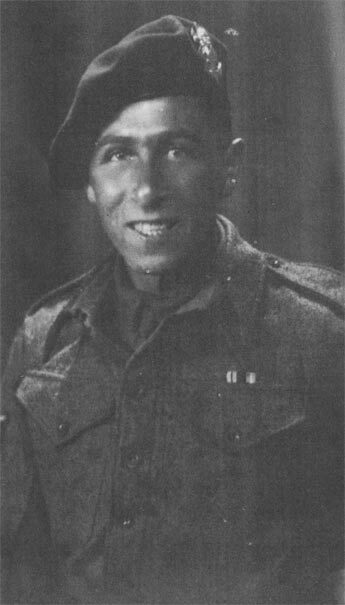 Woolf Blint went on to be repatriated back to the United Kingdom and eventually demobbed from the Commando and the Army. After the war he took up employment in his family’s leather good business, before emigrating to Australia in 1952. He often wondered what had become of Father Pyotor Nicholous and whether he had in fact been a genuine Roman Catholic Priest, or a Nazi collaborator, or  even worse  an escaping German Army Officer, fleeing with looted gems and jewellery.